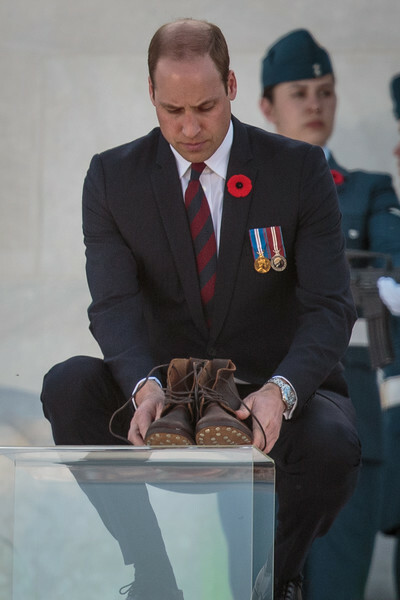 Prince William, Duke of Cambridge lays commemorative boots at the Canadian National Vimy Memorial during a Vimy centenary commemorative service on April 9, 2017 in Vimy, France. The Prince of Wales, The Duke of Cambridge and Prince Harry along with Canadian Prime Minister Justin Trudeau and French President Francois Hollande attend the centenary commemorative service at the Canadian National Vimy Memorial. The Battle Of Vimy Ridge was fought during WW1 as part of the initial phase of the Battle of Arras. Although British-led it was mostly fought by the Canadian Corps.